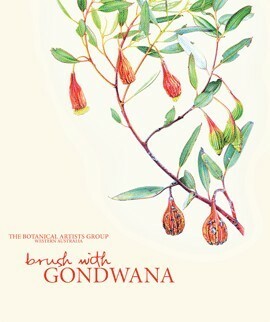 Brush with Gondwana is another lovely gift book celebrating the work of botanical artists. With an introduction by Janda Gooding, Senior Curator of Art at the Australian War Memorial, this book comprises an introduction to each artist and full colour illustrations of their work. These artists came together in 1991 when they met for the first time and realised that they had professional needs in common. The Art Gallery of WA had held an exhibition called Wildflowers in Art which covered the development of botanical art from its beginnings with William Dampier in 1699 through to the work of contemporary artists documenting the glorious variety of plant life in WA. (See my review of Dampier’s Monkey if you aren’t familiar with his role in the exploration of Australia a century before Cook). Philippa Nikulinksy (whose work you’ve seen here at ANZ LitLovers before); Pat Dundas; Rica Erickson; Penny Leech, Margaret Pieroni, and Katrina Syme decided to form the Botanical Artists Group (otherwise known as BAG, giving rise to self-appointed droll nicknames such as Old Bag, Super Bag and Tea Bag). Ellen Hickman (see her work here) was an addition to the group in 1995. The issues that concerned them are common to many who work in the arts: professional isolation, techniques and media; exhibitions and promotion; and dealing with copyright, contracts and commissions. However, the scientific aspects of their work also meant dealing with the detail of botanical queries as well. Their association as a professional group became a useful forum for sharing ideas and resources – and it also provided social support, with food and fun high on the agenda. This book (published first in 2008 but now in paperback) is the first time they have published together, and it is a beautiful testament to the power of collaboration. It is interesting to me as an amateur lover of botanical art to see these artworks together so that their styles can be compared. You might think that there wouldn’t be much difference, given that these are scientific studies of flora – but there is. As Janda Gooding points out, it’s a mistake ‘to dismiss botanical illustration as simply an exact painted record of a plant specimen’ (p.15). Each artist has her own way of looking at plants: as we saw in Firewood Banksia, some artists observe a plant throughout its cycle, while others are more interested in the separate parts of a plant. Rica Erickson, (1908 – 2009), must have been a remarkable woman. With no formal botanical training, she began researching WA orchids as a result of a friendship she developed with Dr D S Rogers, an orchid specialist from Adelaide. As a trainee teacher she abandoned her initial use of black-and-white drawings, and thanks to a friend who gave her a gift of some watercolours, she began a long and illustrious career in botanical illustration. But it was the exhibition Wildflowers in Art that brought her into contact with the younger artists who eventually formed the Botanical Artists Group, including those who had been influenced by the books she had published over the course of her career. Her paintings are the most ‘classical’ of this collection, all of them showing the plant in centre stage but accompanied by neatly labelled scientific drawings of its component parts. There are some gorgeous small orchids represented in this section of the book, reminding me of the delicacy of these plants and their special place in the fragile ecosystems of WA. Pat Dundas is an example of a child receiving the right gift at the right time. Somebody gave her Rita Erickson’s Orchids of the West and ignited a passion for these plants that has lasted a lifetime. She has made a remarkable contribution to the study of orchids by completing illustrations of 408 WA orchids, including those in the Kimberley that had never been painted before. She paints the plants life size, sometimes alone on a page and in other paintings, in situ amongst rocks and other plants. Pat also operates the Botanica Gallery in Pemberton where there is a diverse range of her products for sale. Ellen Hickman uses coloured aquarelle pencils, known to amateurs like me as water colour pencils. Her ‘day job’ is as a consultant botanist assessing sites for development applications, evaluating the impact of land clearing on fragile ecosystems, habitat loss and species loss. Her art is a powerful compulsion that keeps her sane in this stressful work, and the introduction to her chapter explains the exhaustive processes she uses to capture the specimens for illustration. Her approach is classical, showing all the dissected components of the plants, but she composes the work so that it is strikingly beautiful. Even though I know I couldn’t hope to approximate her skill, next time I’m out sketching, I might try doing something like this, if only to experience the process of trying to capture colours in the same way. Penny Leech uses ‘flotsam and jetsam’ in her work so it features shells, bits of rope, feathers and other bush detritus from the Karri Walk Trail near her home in Denmark in southwest Western Australia. Astonishingly, Penny has never worked with botanists or scientists, and is self-taught. She prefers to paint her local environment, depicting exquisite butterflies, gorgeous eucalypts, tiny insect life and even scraps of litter. What is most amazing is the way she has captured small shards of glass and made them beautiful amongst the other found objects. I’ve featured the work of Philippa Nikulinsky before but the illustrations in this book have drawn my attention to her love of spiky plants and twisted wood, especially as they can be seen in arid landscapes. As the introduction to her chapter explains, her paintings have a ‘zen’ feel, though I could also say that they remind me of Japanese ikebana. I also love her use of soft greys and greens, capturing the magic of Aussie foliage so scrupulously, you feel as if you could reach into the book to touch and smell the leaves. Most botanical artists who specialise in wildflowers have to put up with the discomforts of outdoor trekking in pursuit of their subjects, but Margaret Pieroni finds hers at home, on her bush block in Denmark. She built her house on a one-acre block with care so that the local flora suffered minimal disturbance, and now she finds that her daily walks bring fresh discoveries almost every time. The illustrations selected for this collection rejoice in colour, and I was especially taken by the violet of Dampiera hederacea, named – no doubt- after that same William Dampier who dismissed ‘New Holland’ as being of little interest to anybody. These artists follow in the same tradition as the Collecting Ladies that supported Baron Von Mueller in his work. What is so pleasing to see is that their work is now taken seriously – and is financially rewarded. Or direct from Fremantle Press.